One of the greatest issues facing American law enforcement is the cost of training. Many agencies are stretching their training budgets beyond the breaking point and few officers have the time or money to seek out extra training on their own. That's why it's imperative that agencies and officers take advantage of free training when it's offered. Here's a look at four programs that offer high-quality training for free (or extremely low cost) to sworn officers. The goal of Below 100 is to bring the number of annual law enforcement duty deaths under the century mark. That's not an easy goal to achieve; more than 100 law enforcement officers have died in the line of duty each year since 1944 when 93 duty deaths were recorded. The lowest recent annual duty death total was 2013 when 116 officers died on duty. Dale Stockton, executive director of Below 100, says the tenets of Below 100 seem simple, but he reminds people who think that way that "simple does not mean easy" when it comes to changing police tradition. "Existing culture can be a very powerful influence, especially within the law enforcement paradigm where new, impressionable officers who are on probation readily adopt what they see as the organizational norm." For more information on Below 100 and Below 100 training, go to www.Below100.org. 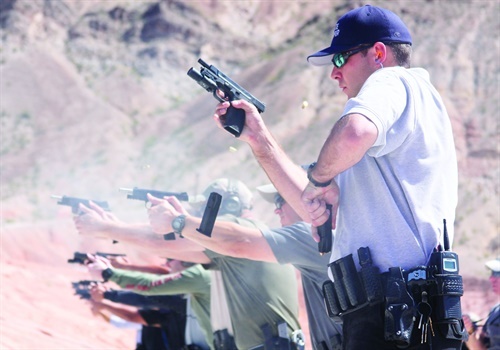 The Law Enforcement Education Program (LEEP) is a special set of courses offered each year at the Shooting, Hunting, and Outdoor Trade (SHOT) Show held in Las Vegas each January. The program is sponsored by the National Shooting Sports Foundation (NSSF) and POLICE Magazine. Technically LEEP is not free. This year an officer could attend all of the classes offered in the program for $25, so let's just say "free." The 2018 slate of LEEP classes included a track of classes offered by the National Tactical Officers Association and a track of classes sponsored by other organizations and product vendors. 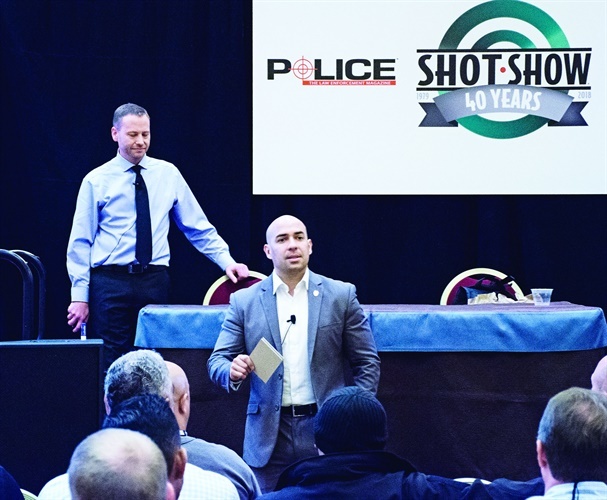 The NTOA track included four classes, "Top Tactical Concepts for Law Enforcement Operations," "Active Shooter Update and the Advanced Police Officer," "Law Enforcement Response to Suicidal Subjects," and "The Future of Tactical Patrol Operations." Each class was taught by an NTOA subject expert. LEEP's organization and vendor program track included classes on how to use reflex sights on handguns, responding to active shooters, using laser training guns to teach shooting skills, training to achieve peak performance, CQB shooting with a carbine, fitness and diet for law enforcement officers, reducing the effects of shooting range noise, vision training for improved tactical performance, officer/citizen encounters, using explosive detection dogs, and developing better community outreach programs. LEEP classes are open to any law enforcement officer attending the SHOT Show. The LEEP schedule is usually released each fall before SHOT. Some classes fill up quickly. For more information, go to http://shotshow.org/leep/. Khyber Interactive Associates' "Lights, Sights, and Lasers" is free to law enforcement officers because the class is paid for by corporate sponsors. "Lights, Sights, and Lasers" is a one-day class that focuses on when and how to use these tools. The first half of the training takes place in the classroom, and the second is conducted on the range. "The goal is not to provide a product demo event. We don't do any of that. It is purely training. The goal is to provide a free training class to law enforcement, military, security, and people involved in the training side of things, and bring it to as many people as possible," says Wes Doss, Khyber's founder and president. While "Lights, Sights, and Lasers" is free, there are some incidental costs for the trainees. You need to bring your own firearms, gear, ammo, and flashlight and provide your own transportation to the event site. Other than that, you just sign up and show up. Attendees also get several bags of gear from the course sponsors, including a "tour T-shirt" and a stainless steel water bottle. And you don't have to worry about getting rained out. If it's sleeting, snowing, if it's literally below freezing, the training will go on—unless doing so is impossible or poses a serious danger. "In Alabama, sheets of water were coming down on us as we trained in the rain. But officers need to deal with bad guys when it's raining, snowing, and muddy," Doss says. It's also important to Doss that everyone who signs up realize the benefit of the training, and not squander the opportunity. "If you sign up and fail to show up, you've kept somebody else from enrolling in this class," Doss says. "Be serious. It's a free class. If you sign up, come on out." "Lights, Sights, and Lasers" is hosted by law enforcement agencies nationwide. To learn about events in your area, go to www.lslustour.com. Created by the Department of Justice in 2010, the VALOR Initiative offers free training to officers nationwide. VALOR programming was developed by the DOJ's Bureau of Justice Assistance. "We put together a group of subject matter experts who took a look at research about violent encounters that had already occurred to see what we could learn from those past incidents," says Deborah Meader, policy advisor with the BJA's VALOR initiative. According to Meader, the goal of the VALOR Initiative is to help officers rediscover and hone their officer safety skills. "We want them to be able to identify, react to, and survive any type of violent encounter they might experience," she says. The VALOR Initiative trains officers through two basic programs: regional classes and short online sessions that are only accessible to credentialed law enforcement officers and are designed for in-service and roll call training. The two-day VALOR Regional Training class examines emerging threats, techniques for anticipating and surviving a violent encounter, and other survival tools for state, local, and tribal officers. In addition to the standard VALOR program for all officers, VALOR offers a Train the Trainer Workshop and an Executive Briefing. VALOR training also addresses active shooter response. The VALOR Initiative partners with Texas State University in San Marcos to provide active shooter response training under the ALERRT (Advanced Law Enforcement Rapid Response Training) program. ALERRT classes available from VALOR range from Basic Active Shooter to First Responder Operations in Rural Terrain. Regional VALOR training sessions are conducted at no cost to the host agency or to the officers who attend. "We want to disseminate this across the nation, so we go out to them," says Meader. For more information, go to www.valorforblue.org.